Mature tomato hornworms can reach 3 inches long. 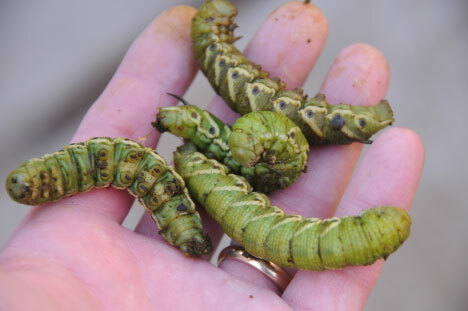 They come in various hues of green to gray, but are distinguished from other hornworms by the eight v-shaped stripes running along the length of their bodies and a black horn on their rear end. The coloration allows these large caterpillars to remain cryptic within the canopy of tomato plants.